I can't believe I've been able to keep up with this challenge! I got through week 2 and posted my block every morning. Some of these scraps are 7 or 8 years-old - I used them in one of my very first quilts. I put them all up on my design wall just now and they look amazing! I'm so excited about this quilt. I saw that a few participants in the QAL are sewing borders on their block in preparation for putting the blocks together in a quilt. I think this is a pretty good idea and I might start doing that too. Although I'm not quite sure if I want to go with pure white, off white or light grey. Any thoughts? State of Being... in Jamaica! If you're a member of the Modern Quilt Guild, you probably received the State of Being pattern back in June 2016. It was designed by one of my favourite designers: Cheryl Brickey of Meadow Mist Designs. As soon as I saw it in my inbox, I immediately added it to my list for the Summer. I had a large cut of Kona Jamaica so decided to use that as the background. The other fabrics are Kona Ash and Kona Kumquat. I just love the contrast of the Kumquat against the Jamaica. For the quilting, I went with something quick and easy - wavy vertical lines quilted with the walking foot. This is project number 5 on my FAL list for Q3 of 2016. 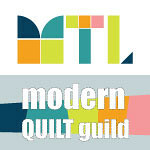 I'll also be linking up at Crazy Mom Quilts and at Anja Quilts for TGIFF. A few weeks ago, I was scrolling through my Instagram feed when I saw that a super fun and challenging quilt-along would kick off on August 17. The goal of this QAL is to make one block a day for 100 days. And which blocks you might ask? The Tula Pink City Sampler blocks! I bought the book about a year ago and I've been wanting to sew with my scraps so I just had to jump on this one. If you would like to follow along, just search for the #100days100blocks hashtag on Instagram. I plan on making the "Skyline" quilt with my blocks and will be using a different colour for each "column", starting with orange. I even created a Pinterest board for inspiration. I'm having so much fun making these blocks and posting to Instagram! There are already more than 4,500 pictures tagged with #100days100blocks - so much eye candy - so much inspiration! It's back to school time! I don't make a lot of handmade items for school, but every year, my daughter Marianne asks for a new pencil case. She has lots of pencils and pens and a huge scientific calculator which also needs to fit into the case, so this year, I made her pouch a little bit bigger than the typical pencil case. I used this tutorial, which I also used to make my Sunny Zipper Pouch a few weeks ago. I had fun fussy cutting some of the 2" squares (isn't that fox cute?!). I love how neat the zipper tabs look. And I'm getting so much better at sewing zippers! I just love those Avalon dots (by Fig Tree & Co for Moda). And every last bit of this zipper pouch was made with scraps, which is the best part! And I'm happy to say Marianne was thrilled with her new pencil case! 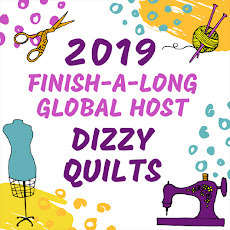 I will be linking up Crazy Mom Quilts when she comes back from her social media break and at The Quilt Journal who is hosting TGIFF this week.